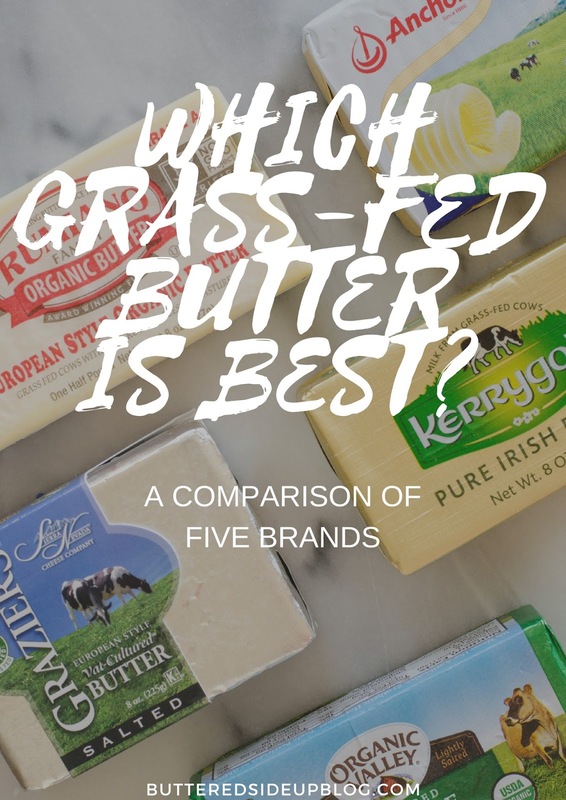 With so many grass-fed butters on the market these days, it’s hard to decide which one is the best to purchase. 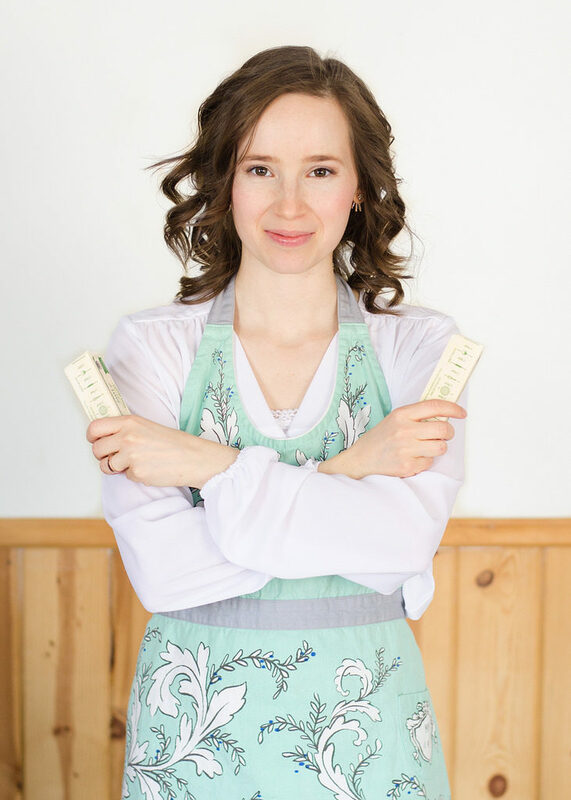 I’ve got you covered with a review of 5 grass-fed butter brands! It’s no secret to those that know me well that I’m a butter fanatic. And I’m a grass-fed butter fanatic in particular. Since I enjoy butter so much, I thought I’d share and compare some of my favorite brands with y’all and let you know which one I personally think is the best. We’ll be looking at taste, color, ingredients, price, and more! First of all, here’s an overview of what the five grass-fed butters look like. 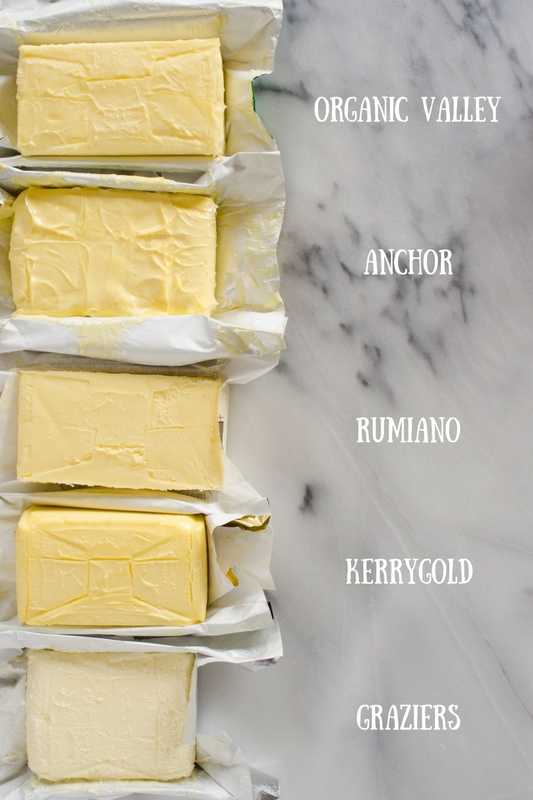 If I were to visually compare the butters from darkest yellow to lightest, here’s how it would go: Kerrygold, Anchor, Organic Valley, Rumiano, Graziers. Color: 4/5 – The color is quite good, but it’s ONLY churned May-September, so I would have thought it would be a bit darker. Taste: Since this butter is cultured, it has a bit of a tang to it, almost cheese-like. It is only lightly salted, so it can taste a little more “oily” than I like. But it is AMAZING on popcorn. It makes it taste like theater popcorn, only more real. Ingredients: Pasteurized Organic Sweet Cream (Milk), Salt, Microbial Cultures. Availability: You will most likely be able to find this butter in a health food store. You can also purchase it from Azure Standard. It’s also available on Amazon . Price: This butter retails for around $9 a pound. However, you can find it for $7.25/pound on Azure, or as low as $6.50 if you buy 15 pounds. 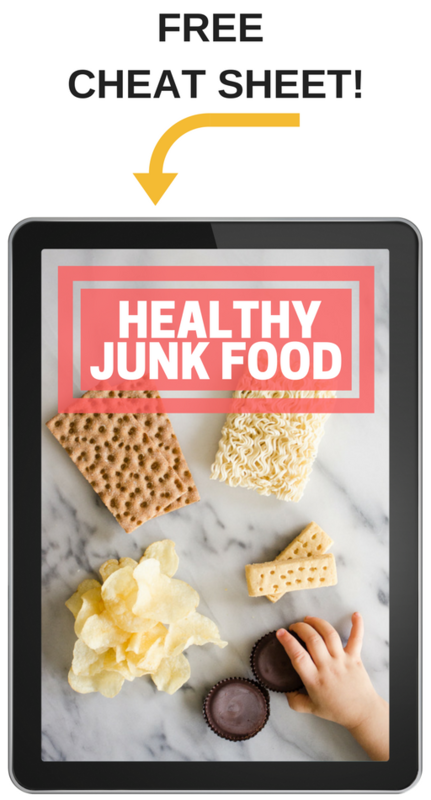 I have purchased it for around $5.50/pound when it went on sale at my local health food store. Taste: Anchor butter has a distinct flavor which is hard to describe – kind of tangy like the Organic Valley Pasture Butter, but a bit different. It has a good amount of salt. It’s also very soft, presumably because it is triple churned. Ingredients: Cream, water, and salt – I’m a bit confused as to why it contains water, but the fat content is actually higher than some of the other butters. Salt: I couldn’t find any information on the type of salt used in Anchor butter. I contacted the company – I’ll let you know if I get a response! I’m not sure what percent grass-fed Anchor butter is, but the cows are on grass all year long. Also, they have a completely organic version that comes in plastic tubs. So if you want to be sure that you are avoiding all GMOs, go for the organic one. Availability: You may be able to find this butter in health food stores or specialty/non-big-box grocery stores. I went into a local grocery store and had them special order Anchor butter for me. I was even able to haggle about the price! You can also purchase it on Amazon . Price: This butter retails for about $7/pound for the non-organic version, or $9.30/pound for organic. I was able to convince the grocer to lower the price of the organic butter to the same price as the non-organic one. Score! Taste: This one was pretty salty. The flavor is more like regular butter. I’m not sure if it’s because it comes in a regular paper wrapper, but this one had an almost freezer-burnt flavor. But I find that most regular (non-grass-fed) butter has that flavor. Ingredients: Organic cream, sea salt. Salt: Rumiano uses sea salt, but it’s not clear if they use unrefined or refined sea salt. Availability: I haven’t seen Rumiano butter in any local stores, but a grocer might be willing to special order it for you. You can purchase it from Azure Standard. Price: I’m not sure what the retail price is, but you can get it on Azure for $3.75 for a half pound, or $5.21 a pound if you buy 15 pounds. 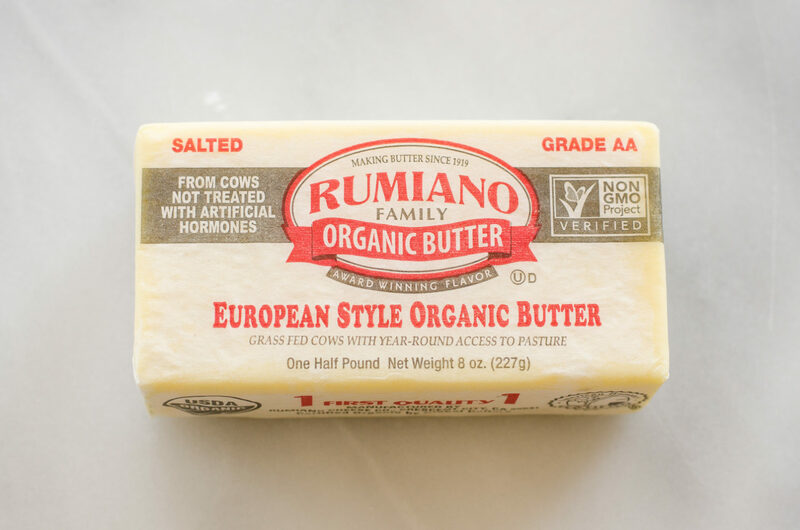 NOTE: Rumiano also makes a non-organic butter. It is always deeper yellow in color than regular butter, and it’s cheaper than their organic version. You can get it for $3.85/pound at the time of writing this post (prices fluctuate). You can find it on Azure. Taste: This is just straight-up good tasting butter. SO much better than regular butter. It has a nice amount of salt and isn’t bland. Salt: I haven’t been able to find any info about the salt used. Kerrygold has lost popularity in the healthy food community in recent years because it came to light that their butter is NOT 100% grass-fed. According to Kerrygold: “Irish dairy cows enjoy a healthy grass-based diet all year round. During peak milk production in the summer months, cows graze outdoors on our lush green pastures all day long. Even in winter months Irish cows enjoy a predominantly grass-based diet. They eat silage which is fermented high moisture fodder cut from summer grass and stored for winter feeding. Irish dairy cows enjoy a healthy grass-based diet all year round. The vast majority of an Irish cow’s diet, almost 85 per cent, is from rich, natural grass. Supplementary feed makes up about 15 per cent of a cow’s diet. The exact percentages can vary depending on availability of the ingredients. In other words, maaaaybe 3% of the feed given to the cows that produce milk for Kerrygold is GMO. Availability: Kerrygold is widely available. 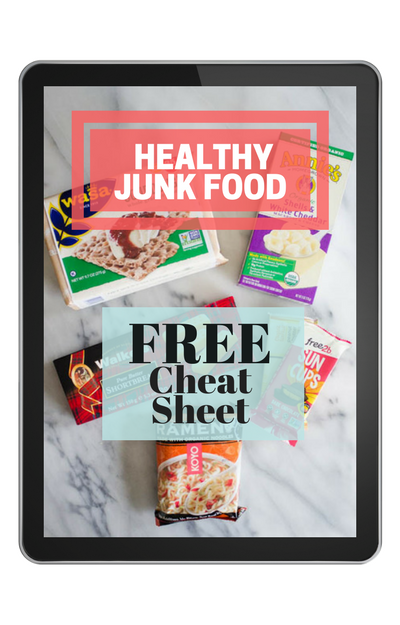 You can get it at Walmart, Target, local grocery stores, and health food stores. You can also purchase it on Amazon . Price: Kerrygold runs about $3.25/half a pound at our Walmart, but I know it’s cheaper at Trader Joe’s or Costco. NOTE: The Kerrygold unsalted butter is cultured. Color: 3/5 The color is a little darker than regular butter, but not a lot. Perhaps I got a light batch? Taste: This butter has a lovely, light flavor. Almost a buttercream frosting flavor. But it doesn’t have enough salt for my taste. Salt: I haven’t been able to find any details about the type of sea salt used. Availability: I haven’t seen this in any stores. You can purchase it from Azure. Price: On Azure it’s $4.40/half pound, or $7.12/pound if you buy 6 pounds. Which Grass-Fed Butter is the Best? 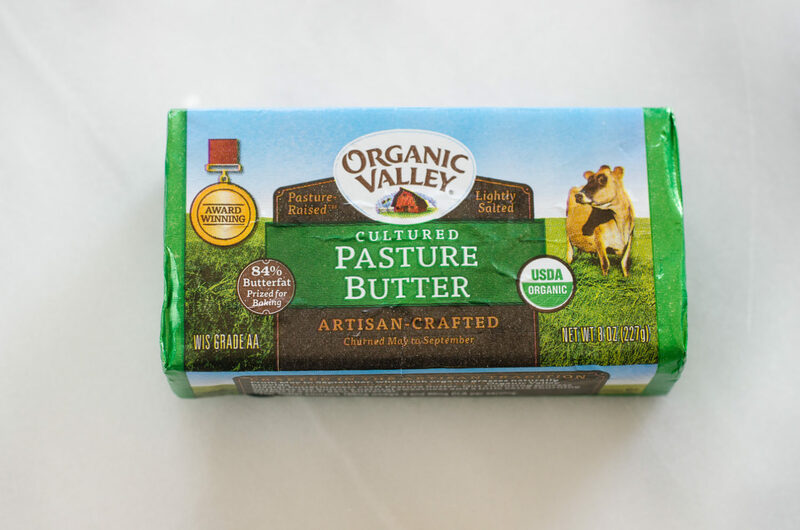 If we’re talking pure health-factor, I would say that the Organic Valley Pasture Butter is the best. It’s certified organic so you know that any supplemental feed is non-GMO and organic. Also, the butter is cultured so it has the added benefit of being a cultured food. If we’re talking taste, it really depends on what you’re looking for. 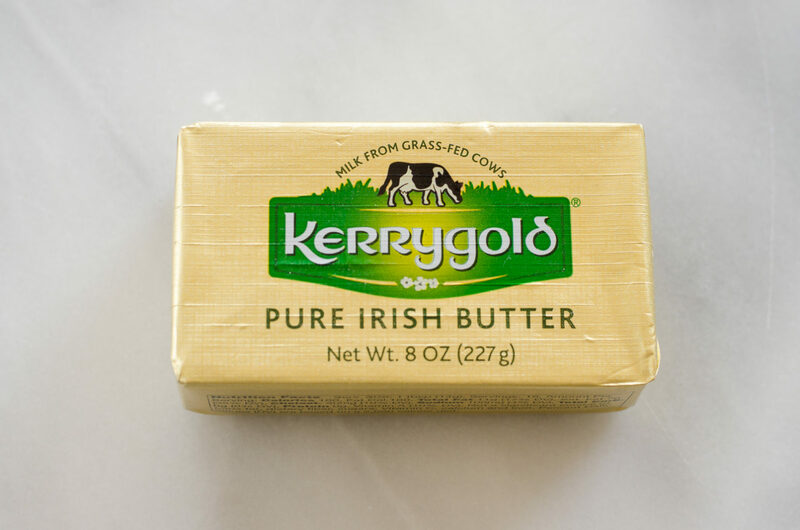 If you like a very normal butter flavor, I think Kerrygold is best – it’s WAY better than most store-bought flavors, but it isn’t funky at all. And if you like a bit of tang, Anchor butter is definitely distinct. The Organic Valley is also very nice, but it isn’t quite salty enough for my taste. If we’re talking availability, Kerrygold wins hands-down. I mean, it’s available at Walmart! If we’re talking value for money, I’d say the Rumiano wins. It’s USDA organic so you know that the cows aren’t fed any GMOs. It’s also Project GMO certified, and it’s a nice deep yellow color. AND it’s only $5.21/pound on Azure if you buy 15 pounds. If you’re really strapped for funds, you could also buy the non-organic Rumiano butter. The cows might be fed GMO-grain, but it’s always a deep yellow color when I buy it, so you know the cows are on pasture. WHEW! That was a lot of info. There are several other grass-fed butters on the market, but these were the ones that seemed most readily available to me. Let me know if there’s a brand of grass-fed butter that you’d like me to test out! Why are most US butters salted? Where I am (in Europe), unsalted is more common. I purchase Unsalted Organic Valley Cultured Butter. I also purchase Unsalted Finlandia if it is on sale. US dairies produce butter that is not as soft as most European brands. Which butter were you talking about? If you’re talking about my 5/5 rating for the Kerrygold butter, that’s specifically about the color. Kerrygold had the darkest color, which is why I gave it that rating. If you read my final thoughts, you’ll see that I gave Organic Valley Pasture Butter the win as far as nutrition goes, and Kerrygold won for availability. Salt is added for longer shelf life I believe. I prefer unsalted myself. That's definitely a lot of info and I am so glad you tested and shared it all. I personally love Kerrygold and a European butter Plugra. I'll have to check out Plugra – thanks for the recommendation! I’ve been learning about the benefits of RAW grassfed butter. Would any of these be considered raw? Where would I find raw butter? No, none of these are considered raw. The cultured ones would have some good bacteria added back in, so those would be the closest to raw. You would have to live in a state where raw milk is legal to sell in the supermarket to get it. I’m not aware of any national brands since you can’t transport raw milk into a state where it’s illegal. Organic Pastures sells a raw butter, but it’s only available to California residents. BUT raw cheese is legal all over the US! Not many choices around here but Greenfields Irish butter in the black foil package is my favorite. Not as soft as the kerrygold, similar saltiness, fuller richer flavor in my opinion. Costs roughly the same at 6-$7lb but harder to find. Discovered on clearance for $1 per 1/2lb at meijers. Hi! Thanks for this…. The Organic Valley above says “84% butter fat – prized for baking”….. I’ve seen others brands note as high as 92%….. are you able to help me undertand the various beneifts of high and low % and what is ideal? Thanks!! I did a little research on this, and it seems like the different butterfat percentages are good for different things. Things like puff pastry and pie crust do well with the higher butterfat since the butter contains less water, but things like scones, chocolate chip cookies, eclairs, etc. are just fine with the lower butterfat, or some say even better. What about President butter? Just got it in my country and would like feedback. Absolutely amazing research 👍I use Organic valley mostly and want to try kerrygold, that’s how I found this. Thanks for all the helpful info. The only thing I don’t like about the OV butter is that they don’t use sea salt; otherwise, it’s very good. Yes, it’d be great if they used unrefined salt! Can you comment on Challenge Butter from California. The package states grass fed, but I called them and they said the cows diet did include grain. I don’t see the word Organic on the package, so not sure about that. The representative did say Kerrygold was pasteurized like that was not really that good, but I’m not sure about that either. Thanks and thanks for all the research. It was a great read. I wasn’t aware that Challenge Butter was grass-fed! Are there different products? The one I saw at our local Walmart didn’t state anything about being grass-fed. Of course non-pasteurized, cultured butter is ideal, but that’s not an option for most people since raw milk is illegal to commercially sell in a lot of states. I was looking at the Graziers butter in the store today. I read your description above from Azure Standard, which says the cows eat only non-GMO grains. I called Graziers up too, and they said the same thing. However, they told me that the package mentions this fact as well, but it does not. Just curious—how reliable do you think their claim of feeding only “non-GMO” grains is? Incidentally, at my local store, half a pound costs about $4.70, which is more than the Organic Valley butter. Interesting! I guess there’s no way of knowing for sure that they’re telling the absolute truth unless it’s third-party non-GMO certified. They claim that at least 70% of the diet is grass, so that wouldn’t be GMO. 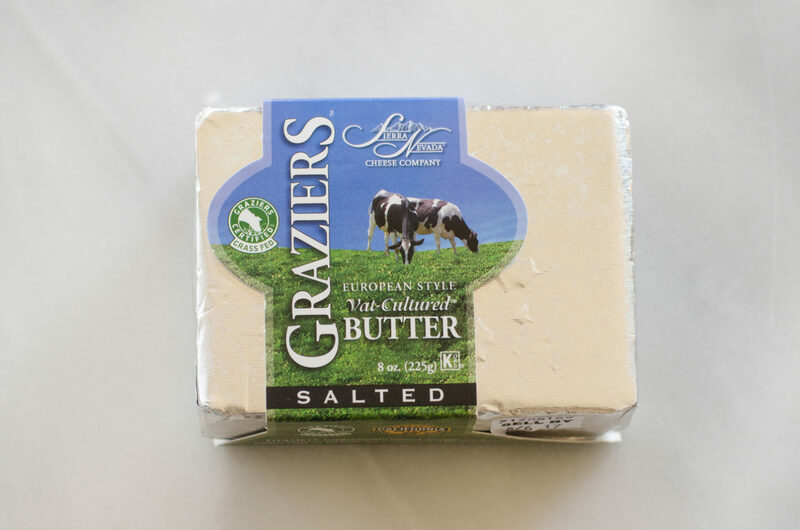 Graziers is under the brand Sierra Nevada Cheese Company, and they do sell an organic butter. But it says nothing about being grass-fed, so it could come from cows raised in confinement that are fed organic grains. But you would know that it’s GMO-free if it has the organic labeling. The Organic Valley and the organic Rumiano butter are sure to be GMO-free as well, and they’re both grass-fed. I personally tend to believe what they say, but I am just taking their word for it! Thanks for your helpful reply, Erica. 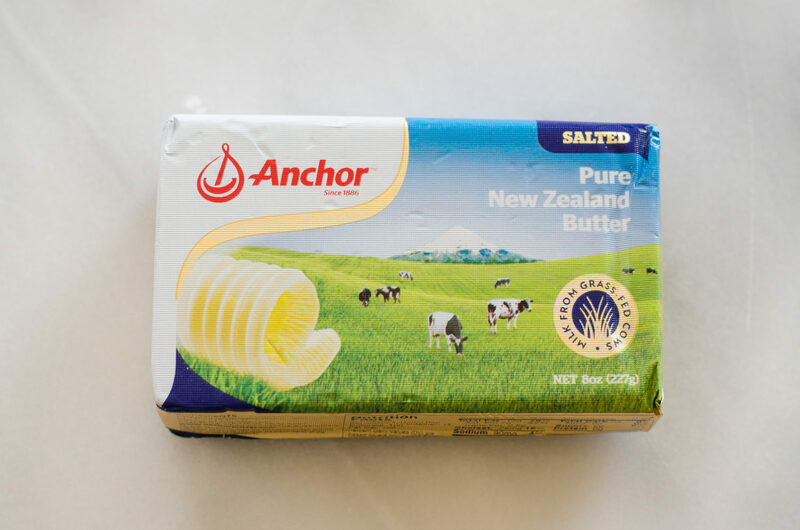 Hi Ericia suggest you check out the Anchor butter . The name was sold about 6 years ago to a British company Arla. Here in the Uk butter is produced under that name which is no match for NZ butter. As Arla bought the name they claim that they have been making butter for over 130 years. No only the last 6 years here in UK. Very deceiving. So as a NZ’er I’ve changed to Kerry Gold as I can no longer get ‘real butter’ here.! Interesting! I don’t think I had heard of Arla butter before. Do they claim to be grass-fed? Technically all of these butters are “pasture” because they’re all grass-fed. But things like the color of the grass, what time of year the butter was made, etc. affect the color of the butter. just to verify – kerrygold salted butter is not cultured and their unsalted butter IS cultured? Is there a large difference in taste and moisture content between the two? – as I use both for baking. Thanks! Yes, as far as I know the unsalted Kerrygold is the only one that’s cultured. I haven’t tasted the unsalted Kerrygold plain since I dislike unsalted butter. I’ll have to grab a block and give it a try! I tried it several years ago, but then our health food store stopped carrying it. I LOVE that they use unrefined salt! I saw that it was in at our HFS again, so I’ll have to get a pound and try it. Erica, your review(s) are great and very timely for me. Just switched to grass fed butter this year for the health benefits and have been buying Kerrygold because they sell it at Trader Joe’s. Had been wondering how it compared to the more expensive brands at Whole Foods. Happy to learn Kerrygold can compete. Just an FYI..we keep chickens that have access to green grass in addition to their organic laying mash. Their yolks are bigger, darker and more viscous than the any of the pastured eggs from Whole Foods. So I wonder how important it is that the cows be 100% grass fed to reap the health benefits. So glad you enjoyed reading my post! As for the comparison between Kerrygold and Anchor, I’m not sure what percentage the cows that provide the milk for anchor are grass-fed and if they get supplemented with grain. So it’s hard for me to make a call there. My gut (ha!) would say that Anchor is slightly more healthy since it’s cultured, but I don’t have the numbers to back that up. And if you buy the organic version of Anchor I’d definitely say that it’s more healthy than Kerrygold because you’d be certain that the cows were fed zero GMO grains. Thank you for posting this blog! Very helpful! I’m considering switching from Kerrygold to Organic Valley based on just finding out they use 3% GMO feed to supplement. But this an assumption on your part. I think you should find out and verify whether or not they truly do use GMO supplemental feed or not. I am only interested in facts, not assumptions. Thank You. Is that new info that 3% is definitely GMO? When I did my research, it sounded like that 3% was “Maybe GMO, maybe not.” But did you find some updated info? Since Organic Valley is certified organic, the cows can’t be fed GMOs because organic = non GMO. So the cows’ feed is organic and non-GMO. None of these butters claim to be 100% grass-fed, but I tried to give information that I have found on how much grass the cows are getting. For example, Graziers says that their cows are on pasture at least 300 days out of the year. You could contact the brand if you want further info, or let me know your specific question and I could contact the brand. In Denver, I haven’t seen stores selling any of these other brands (aside from Kerry Gold), I have seen Vital Farms that makes grassfed butter as well as cage free pastured eggs. *** This review is worthless because the Author is uninformed. The author doesn’t actually know what is in these butters. For example, Kerry Gold is being sued in CA for NOT being grass fed. They feed GMO grains, soy and corn. I wonder how many of these butters are actually solely grass fed… I doubt any of them are. Did you read the post? I clearly stated that it’s a well-known fact that Kerrygold is not 100% grass-fed. And Kerrygold freely admits this. The lawsuit isn’t claiming that the cows are eating grains exclusively, just that it’s misleading to say that the milk is from grass-fed cows when they are fed some grains. Also, I didn’t claim that ANY of these butters are solely grass-fed. Here are three butter facts for the day: First, butter is delicious and that’s undeniable! Second, among other great sources of healthy fat, like olive oil, avocado oil, and coconut oil, butter is also one great source of healthy fat, and It is rich in fat-soluble vitamins. Lastly, while there are a lot of consumables that can kick one out of ketosis, butter is thankfully not one of them. Ketogenic and non-ketogenic butter-lovers can enjoy butter, as long as it is consumed in moderation. Still, too much of a good thing is a bad thing, right? i would watch out for Anchor’s butter. Their butter is very commonly used here in Hong Kong because it’s very cheap and tasty compared to other brands of butter. the price i’m talking about it’s half to a third of a kerrygold butter sold here. maybe a third of a fourth of the organic valley butter. I think only a particular line of butter in their collection is grass-fed. It has a high percentage of trans fat in it even though it has a short ingredient list.